Aditya Kapoor is a banker turned author and a bestseller. He is a literary gem and is living a balanced yet a starry personal and a professional life. Anything and everything he touches turns into gold. He has everything a man can dream of, a loving family which has a beautiful wife 'Maya' and a sweet kid. Then there is Shreya Kaushik, a student at IIM Bangalore who is beautiful, young and ambitious. She is instantly expressive about the ramblings of her mind and loves to chase her dreams, quite bold and straight forward. Currently she wants to be a bestselling author and is quite obsessed with that dream. She is best at what she does, one of the top authors but now she wants to be the bestselling one. One fine day, Aditya's and Shreya's worlds come together. Shreya wants Aditya to make her the best selling author. What happens next is for you to find out. Can one person love two people at a given point in time? Can one wisely make a choice between blind passion and ambition? Is it possible to trust someone again after betrayal. Is it still love when you betray someone? Ravi Subramanian, an alumnus of IIM Bengaluru, has spent two decades working his way up the ladder of power in the amazingly exciting and adrenaline-pumping world of global banks in India. For Ravi Subramanian, The Bestseller She Wrote, marks the beginning of a new chapter in his writing. A significant departure from his usual fare of banks and finance and corporate life. This is Ravi Subramanian ’s first book on romantic intrigue. This is mine also a first attempt at Ravi Subramanian 's novel and it didn't turn out the way I was expecting. Much hype about but it left me disappointed. A typical bollywood movie script, full of usual masala and love triangle. The extra marital affair in the novel put me off. Quite predictable plot. The characters are weak except Shreya's over possessive nature which has taken most of the novel's space. Wish the author had portrayed Maya's character a little strongly. She wasn't given much attention even when she was ill and in the hospital. Well, the book had nothing new to offer. I couldn't keep the book down because I just wanted to finish it as soon as possible. I just could not afford to spend more time on it. I just hope Indian novelists come out of MBA mode, its just too repetitive. Things I liked, simple English, small chapters and quirky cover page. Read if you really want to "At Your Own Risk". P.S. 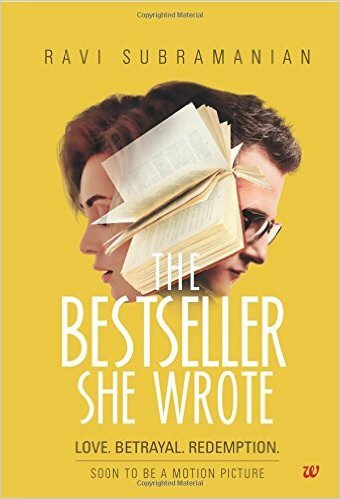 I am reviewing ‘The Bestseller She Wrote’ by Ravi Subramanian as a part of the biggest Book Review Program for Indian Bloggers. Participate now to get free books!